While producing the standard F-boat for the open market, Curtiss also built custom-designed 'boats to special order. These were usually named to the preferences of their owner rather than being given Curtiss designation. McCormick Boat. In 1914, Curtiss delivered a special five-seat tractor flying-boat to Harold F. McCormick, who used it for business and to commute from his Lake Michigan home to his Chicago office, a trip of 28 miles (45 km). The McCormick 'boat was considerably larger than the F, with the cockpit behind the wing and the engine ahead of it as on the 1911 tractor hydro. McCormick's 'boat was eventually rebuilt to put the cockpit and powerplant in the standard F-boat arrangement. Span 38 ft 4 in (11.68 m); span across ailerons 41 ft 8 in (12.69 m); length 24 ft (7.31 m). Powerplant 100 hp Curtiss OXX. 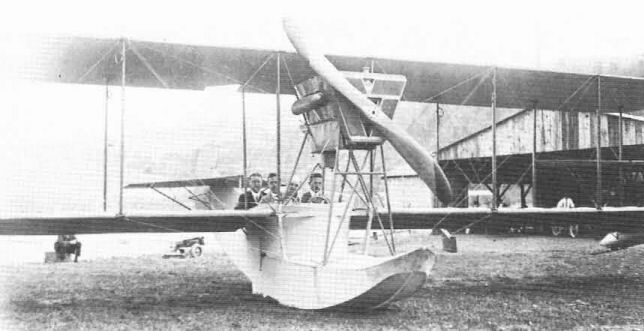 Thc Curtiss McCormick flying-boat of 1914 was built as a tractor but was soon modified to have the engine at the rear and the pilots and passengers ahead of the wings.